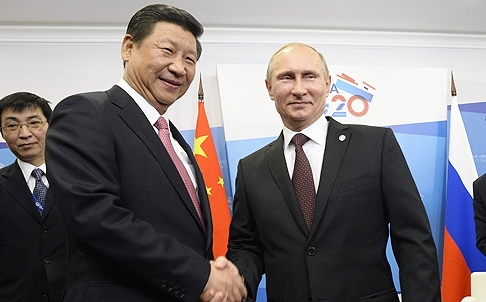 President Xi Jinping with Russian President Putin. In the current multipolar world in which we live, economic and military factors are decisive in guaranteeing countries their sovereignty. Russia and China seem to be taking this very seriously, committed to the de-dollarization of their economies and the accelerated development of hypersonic weapons. The transition phase we are going through, passing from a unipolar global order to a multipolar one, calls for careful observation. It is important to analyze the actions taken by the two world powers, China and Russia, in defending and consolidating their sovereignty over the long term. Observing decisions taken by these two countries in recent years, we can discern a twofold strategy. One is economic, the other purely military. In both cases, we observe strong cooperation between Moscow and Beijing. The merit of this alliance is paradoxically attributed to the attitude of various US administrations, from George Bush Senior through to Obama. The special relationship between Moscow and Beijing has been forged by a shared experience of Washington’s pressure over the last 25 years. Their shared mission now seems to be to contain the US’s declining imperial power and to shepherd the world from a unipolar world order, with Washington at the center of international relations, to a multipolar world order, with at least three global powers playing a major role in international relations. The Sino-Russian strategy has shown itself over the last two decades to consist of two parts: economic clout on the one hand, and military strength on the other, the latter to ward off reckless American behavior. Both Eurasian powers have their respective strengths and weaknesses in this regard. If Russia’s economy can hardly be compared to China’s, China plays second fiddle to Russia’s conventional and nuclear deterrents and is quite some way behind Moscow in terms of hypersonic weapons. The cooperation between Moscow and Beijing aims to synergize their respective strengths. Both de-dollarization and the development of hypersonic weapons serve the purpose of defending both countries’ sovereignty. Economic sovereignty entails, among other things, elimination of dependence on the US dollar, the abandonment of an international banking system based on the SWIFT payment system, the inclusion and increase in the share of the yuan in the basket of international currencies, the reduction of dollar-denominated public debt, the constant accumulation of gold, and, of course, the elimination of any residual debt with international institutions that are part of the world governance model controlled and manipulated by Washington for its own interests. Beijing, rather than seeking to replace the central role of the United States, seeks instead to expand its influence in existing organizations like the International Monetary Fund (IMF), the Bank for International Settlements (BIS), the World Bank, and the World Trade Organization (WTO). From an economic point of view, the international order is very similar to a duopoly rather than anything multipolar, without forgetting that the European Union has an important role to play should it regain some form of sovereignty by freeing itself from dependence on Washington. For Moscow and Beijing, reducing public debt is one of the best ways of achieving strong economic sovereignty. The Russian Federation has reduced its public debt in relation to GDP from 92% at the beginning of 2000 to 12.9% today. The People’s Republic of China, over 20 years, has increased its public debt from 20% of GDP to around 48%. Compared to the public debt of European countries (Italy and Greece are over 120%, France 100%, the EU average is 85%), Japan (240%) and the United States (110%), Beijing and Moscow have paid particular attention to keeping their accounts in order. Another important strategy involves the steady accumulation of gold in the reserves of these two countries. China and Russia are once again trending in an opposite direction to that of the West. Since 2005, Russia and China have accumulated huge amounts of gold, with the clear intention of diversifying their reserves. Both Moscow and Beijing are among the top 10 countries in terms of gold reserves, with an exponential increase over recent years. Thanks to a limited public debt, huge quantities of gold, and a progressive reduction in the amount of US government bonds held, Moscow and Beijing have embarked on the path of full economic sovereignty, independent of the US dollar system and strongly protecting themselves against any future financial crises. In this respect, the creation of international financial bodies, to be added to those already existing, has the clear purpose of diluting Washington’s institutional influence over the economic affairs of the world. A decided acceleration in this general direction was made following the exclusion of the Islamic Republic of Iran from the SWIFT system, a ringing alarm bell for the Eurasian duo. Despite their reduction of public debt and significant de-dollarization, both countries remain dependent on, and therefore vulnerable to, an economic and financial system that orbits around Washington and London. The workaround has therefore been to create two alternative bank-payment systems to SWIFT. In the case of Russia, there is the so-called system for the transfer of financial messages (SPFS), and in China, the Cross-Border Inter-Bank Payments System (CIPS). Initially conceived as a fallback in the event of exclusion from the SWIFT system, the SPFS and CIPS projects currently strongly intertwine with the energy agreements reached in 2015. Moscow’s selling of liquid natural gas (LNG) to Beijing takes place through an international payment system based on Chinese renminbi that is immediately converted into gold thanks through the innovative mechanism inaugurated at the Shanghai Gold Exchange. It is not excluded that these operations could not directly occur through the SPFS or CIPS systems in the future. Never mind the petrodollar system that is one of the main problems that China and Russia face when dealing with the international financial system. Efforts to progressively switch from USD to Yuan in paying oil commodities have been in place for years especially by Beijing. This is an example of how countries like Russia and China have found ways of circumventing the means used to limit their sovereignty. The inclusion of the yuan in the IMF basket of world reserve currencies is associated with the Chinese strategy of supporting the renminbi for export, reducing the share of the US dollar. The strategy adopted by Moscow and Beijing seems to leave Washington unable to stop the protective measures of these two Eurasian powers. In practice, we are already beginning to see the effects of this alternative economic world order. The sanctions imposed by Washington and her satraps on Moscow and Tehran are easily circumvented by Russia and Iran, with exchanges denominated in currencies other than the dollar (often gold), or simply through bartering. China and Russia, with strongly diversified economies, with treasuries chock full of gold, and with minimal public debt, leave very little room for international speculators to have an effect on their domestic economies with actions that amount to financial terrorism. Being able to minimize the impacts and risks of a new financial crisis, or resist the threats and blackmail of the international bodies steered largely by Washington and London, are the key means of being able to chart an economically independent course and ensure national sovereignty. Without a clear and inviolable military sovereignty, the economic measures implemented can become ineffective in the event of war. For this reason, China and Russia continue to implement nuclear-weapons strategies, the ultimate and definitive deterrent. Moscow is at least equal to Washington in this regard, just as Beijing is at least equal to Washington in the economic field. China and the United States have an interconnected economy, but in the event of total war, Washington would suffer the greatest damage. The transfer to China of almost all American industry has a cost, and in the case of a complete rupture in relations between the two countries, Washington is well aware of its economic vulnerability to China. In military terms, the strategy for ensuring territorial sovereignty focuses on certain key areas, namely the defense of airspace and maritime borders, and the ability to discourage any nuclear attack by guaranteeing a second-strike capability. I have written about this in the past, noting that Russia and China have implemented complex and advanced systems in recent years to close the technological gap with the West, Moscow being at least equal to Washington in this regard, and sharing with Beijing some of its most important innovations. The sale of S-400s to China paves the way for a future joint defense of Eurasian airspace. As the process of union and cooperation between the two countries increases, their respective militaries will have the task of discouraging outside attempts to destabilize the region. This is the reason why the United States sees the sale of the S-400 systems (to Turkey, for example) as a red line not to be crossed. The ability to prevent access to one’s airspace upsets one of Washington’s principal doctrines of war. Without air supremacy and the ability to operate in an uncontested airspace, the American way of war is severely hobbled, it becomes practically impossible for the United States to impose its will militarily. The second military focus for the Eurasians concerns the defense of their maritime borders, reflecting Moscow and Beijing’s need to keep the US Navy a good distance from their shores. The development of anti-ship weapons has been a priority for Beijing in recent years, as has been the development of islets in the South China Sea to ensure a constant protection of its borders, given the aggressive presence of the US Navy. Beijing aims to create areas of denial for the US military. Initially keeping US forces about 180 miles from their coast, the future intention is to push them even further back, to a distance of about 700 miles, thus obtaining an effective anti-access/area denial (A2/AD) space that prevents any amphibious assault or a maritime blockade of China’s sea lines of communication. In the same way that de-dollarization represents an economic nuclear weapon in the hands of Russia and China, the development of hypersonic weapons is the linchpin of the Sino-Russian alliance’s ability to defend its territorial sovereignty. I wrote two very detailed articles on these amazing weapons, and so did my colleagues at the Strategic Culture Foundation. It is an exciting topic because, for the first time in years, Washington has faced the accomplished fact of its geopolitical adversary’s impressive technological progress. Hypersonic weapons have no present weaknesses, and Moscow is the only country in the world capable of producing and using them. With this new capability, the range of action of the Russian Federation reaches unprecedented levels. Hypersonic weapons have the crucial advantage of being able to hit mobile or fixed targets with unprecedented speed and power. The ability to obliterate in a matter of minutes a US Navy carrier group or ABM systems in Romania and Poland undoubtedly has a sobering effect on the US military. This is to leave aside the fact that the future S-500 system will have anti-satellite capabilities as well as ballistic-missile defense, and the new SS-28 Sarmat will not be able to be stopped by any current or future ABM system. With the use of hypersonic weapons (some already operational) and the sophisticated S-400 and S-500 systems, US naval and air power is being strongly challenged. With nuclear weapons, even the Russian first- and second-strike capabilities become impossible for the US to overcome. It is only a matter of time before hypersonic technology is brought to bear by the People’s Republic of China, probably with Moscow’s crucial assistance. The level of mutual trust and cooperation has never been so high between the two countries, and it is natural for them to collaborate militarily and economically, spurred by their common opponent. The challenge for Russia and China is complex and ongoing. The transition from a unipolar to a multipolar world order is occurring as we speak, enabled by economic and military sovereignty. The challenge for these two Eurasian countries will be to increase their military and economic power and correct the obvious imbalances in the current world order, without destroying it. If this strategy proves successful, it will only be natural to start offering other countries the opportunity to hop onto the Eurasian train, enabling those willing to shift their military, economic and diplomatic leaning from the Atlantic to the Eurasian world. Given the momentous significance of India and Pakistan’s accession to the Shanghai Cooperation Organization as permanent members, it would seem that Moscow and Beijing are on track to eliminating the central role of the United States in international relations in favor of a multilateralism that will benefit everyone.